Celebrating two years by gifting you. he anniversary is officially October 7, but we couldn't wait another week. After nearly twenty-four months, five hundred articles, nine PlayStation 3 models, seventeen global Wii shortages, and a per capita average of two-and-a-half Xbox 360 breakdowns, Game and Player presses on for more smart video game review and commentary with a new website. The design is clearer and sharper; stylish, if you have the taste. Most importantly, it offers readers practical access to game data — as well as the opportunity to easily weigh in on reviews and editorials in comment threads. What better way to celebrate the launch of our new site design than with a fabulous, week-long prize giveaway? That's right, every day this week we will be giving away prizes sponsored by a different company. Entering to win is easy! 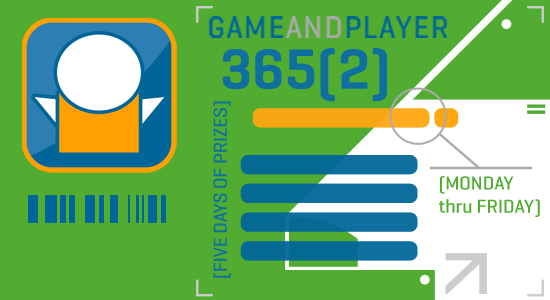 Once per day, send us your name and e-mail address either via e-mail to contests@gameandplayer.net (with the subject line, "365(2) Contest" or in a direct message to our Twitter feed. Entries must be received by 8 PM Eastern to be considered. The festivities may be drawing to a close, but there's a little more elan left in us. Enter for your shot at our Friday grand prize draw! If you've already entered this week, your name is in our hopper. If not, there's still time to get in. And watch closely, as we may add a few giveaways as the mood strikes. Ready for another year? We thought so. Excelsior! Participants must be 18 years of age or older at time of entry and a resident of the United States or Canada (residents of Quebec are not eligible). Limit of one entry per person, per day. Staff and contributors of Game and Player, and members of the immediate families and persons thereof are not eligible. Answers must be submitted via a Twitter direct message or e-mail to Game and Player to be considered valid. Entrants agree that Game and Player makes no warranty, representation, or guarantee of any kind, expressed or implied, in fact or in law, relating to the contest and/or the prizes. The site looks great! Well done to those responsible!! Looks great. Everyone involved did an excellent job. Happy Birthday! I'm digging the new design and the more energetic looking logo man! Thanks, guys. This is the culmination of dozens of hours of work, some critical reassessment, and a liberal dosage of influence from Wipeout and Seed magazine. Indeed, the logo man is raising his arms in triumph! Graph paper! I frickin' love graph paper! It's all I use at home. G&P is an eyeball pleaser. Happy Birfday! Graph paper: not just an artifact from high school mathematics! Testing this Gravatar business, hope it works. Personifying comments is their business, and business is good. The new design looks great, I tip my hat to you! And I love the diagonal arrow with the stylish bar-code line to separate comments...subtle, effective -- and rad. I'm loving the new layout. Everyone that worked on this did a great job. Is there any changes planned for the forums side of things? This site started the same day I got married, what are the odds? I detect cosmic forces at work. Any changes planned for the forums side of things? Good job, I like the new look. The new site is amazing. Can't wait to see your changes for the forum.